At a time of technological revolution involving the Internet, computers, on-line banking, cell phones, high definition television, etc., it seems somewhat archaic to discuss a topic as humdrum as earth dam surfaces. Yet we must keep our dams in compliance with Safe Dam Regulations. The Tennessee Wildlife Resources Agency (TWRA), for whom I work, has 28 dams licensed and in operation in connection with the State Lakes Program. As one might expect, the dams built in the last several years are much better designed and built from an operations and maintenance standpoint. These modern dams have flatter slopes, which allow maintenance personnel to safely mow the vegetation. The tops of the dams are crowned to prevent standing water. The emergency spillways have designed inlet, control, and outlet sections for regulated hydraulic flows. The riser structures permit adequate lake level manipulation for fish management purposes. The project as a unit works. One of my challenges has been to bring some of the older dams into compliance with the regulations. Briefly, I will discuss part of what has been accomplished. Bedford Lake, Bedford Co., Tennessee. Job completed. 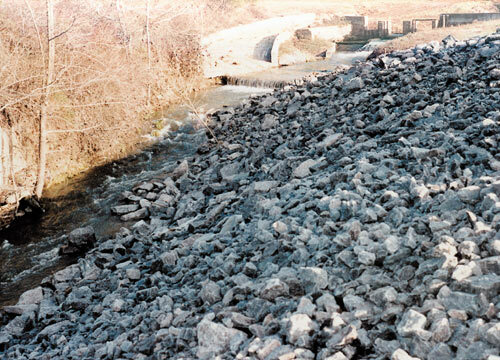 We had one dam (Bedford, TN) which had a steep downstream slope. Our agency inherited it years ago. Back in the days when it was built, there were apparently no requirements other than hoping that it would impound water and create a lake. The downstream slope was approximately 11/2 to 1. No tractor or mower could navigate it. It had simply been neglected and allowed to revert to nature. There were several poor quality trees on it, as well as a cooks mixture of weeds, vines and everything else. It was classified as an intermediate hazard dam until a few years ago when an individual bought property below it and built a dwelling and other buildings. This immediately changed it to the high hazard category. This dam is in an area where limestone riprap is very reasonably priced. We decided to develop a budget and a plan to rework the downstream slope of the dam. We found a contractor who had a daredevil dozer operator who was willing to completely scrape and regrade the dam. 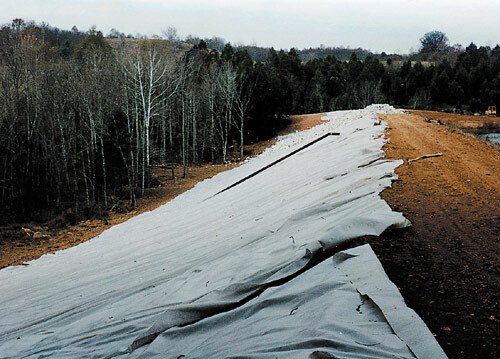 We used a nonwoven geotextile fabric to cover the prepared slope, and then placed limestone riprap over the fabric to completely cover and protect the slope. The total contract price to do this work was $90,000. Since then, the dam has been a pleasure to maintain. Our maintenance crew sprays the riprap with a diluted solution of Roundup® every spring. The herbicide controls the few weeds that seem to crop up. We have had no problems with the Safe Dams inspector since we made these modifications. 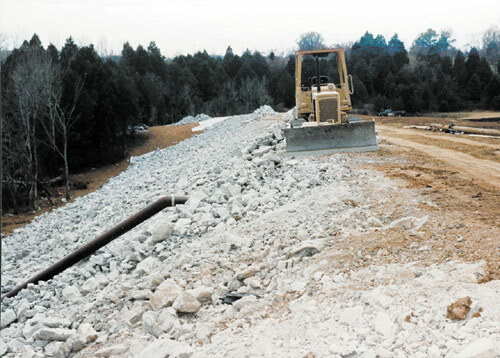 We also gave this same treatment to another TWRA dam in Middle Tennessee (VFW Lake). The same contractor was successful in getting other contracts; the results were excellent. This dam had been targeted for elimination by the Safe Dams Section because they were concerned about a high phreatic line. They were concerned that the downstream slope would slide and the dam would fail. I convinced them to let us regrade the dam, install a geotextile fabric and cover the entire surface with limestone riprap. Since this was a low hazard dam, they gave approval. This work at VFW Lake was accomplished for $45,000. When we try to build a dam today, we have to spend at least two million dollars or more. To save this great little fishing lake for 45k seemed like a terrific return on investment. I convinced them to let us regrade the dam, install a geotextile fabric and cover the entire surface with limestone riprap. Since this was a low hazard dam, they gave approval. This procedure worked well for these two dams. Limestone is readily available in the vicinity of both dams. This is, of course, a controlling factor. We used a different procedure on another dam in West Tennessee, near Humboldt. There we had inherited a dam with a steep downstream slope. The fill material was different from the fill materials used in the two dams mentioned above. Those were filled with high clay content soils with high internal strength. The dam near Humboldt was filled with a ML, or silty type, soil which is very erosive. A steep slope and that type material are a bad combination for a weathering surface. The dam had suffered numerous slides, was almost impossible to maintain, and continued to generate reports from the Safe Dams Section. My plan there was to extend the conduit (actually a box culvert) and to flatten the slope to 3 to 1. Adequate suitable earth fill was available to accomplish this operation. My first choice was sodded Bermuda grass, which I have come to greatly admire and study since that job was completed. We were fortunate to again have a good contractor (who helped sponsor the ACE Conference in Nashville). In most of West Tennessee, limestone is not available. It plays out as one crosses the Tennessee River headed west. Therefore, in this case, we had to use some sort of vegetation as a practical matter. Bermuda grass has far and away been the best vegetation for the latitudes (Climate Zone 6) that are prevalent for Tennessee. Research papers I have read shows that it grows well from our latitude south and west through Oklahoma. It is absolutely the best at surviving the droughts we seem to have with alarming frequency. It will suffer and survive as much neglect as any grass I have seen. If you can get your maintenance folks to mow your dams at least once in the spring or summer (twice is better), the Bermuda will thrive. It does not tolerate shade, so mowing is required for the weeds and brush that try to shade it out. Some high nitrogen fertilizer in the early summer will work wonders, especially in thin spots you are trying to get thicker. Bermuda grass is a true turf grass. It is used widely on football fields. Even the mighty Tennessee Volunteers have removed the artificial turf and put down Bermuda at Neyland Stadium in Knoxville. Does it need any more endorsements? Bedford Lake, Bedford Co., Tennessee. Installing geotextile fabric prior to riprap. The prevalent grass that has been used on our dams is Kentucky 31 fescue. It looks better than it is however. It has several drawbacks, including the inability to spread as Bermuda does. Fescue tends to clump in our climate and wither in droughts. It fades in hot, dry weather, which lets weeds, brush and other noxious vegetation grow. Fescue is simply not a turf type grass. It is probably a better choice for Northern areas with cooler climates. Another grass we have used that has been underwhelming has been Weeping Lovegrass. It is supposed to keep reseeding itself each year. It does to a certain extent, but it does not seem to grow into a thick mat, as Bermuda does. In the past, the vegetation on the newly completed dam has been greatly underrated. We have several horror stories regarding subcontractors who failed to do an adequate job establishing an adequate surface. In some cases we have had to come back with our equipment crews and strip, regrade, and reestablish the surface. We have decided to attack this problem in the future differently. On bid submittals, contractors are required to list the mechanical and electrical subcontractors they plan on using. We are going to require that this be done for the landscape contractor also. At least we will be able to check his prior work. This may not be a panacea, but hopefully it will prevent the homebuilder type thinking where the builder throws out a few seed and a little mulch and disappears. Presentation given at the Association of Conservation Engineers Conference, 1999. For more information, contact Les Haun, TN Wildlife Resource Agency, Edmondson Pike, Room 132, Nashville, TN 37211, (615)781-6547, fax (615)781-5274, lhaun@acelink.net. Information about the Association of Conservation Engineers, as well as conference proceedings, can be found at their website http://conservation.state.mo.us/engineering/ace. ©2001, 2000, 1999, 1998 Land and Water, Inc.